Sols 2304-05, January 29, 2019, update by MSL scientist Christopher Edwards: Today’s plan found Curiosity solidly in new territory and the view couldn’t be more different than the patchy bedrock of the Vera Rubin Ridge. The workspace for the next two sols of planning consisted of fine grained materials with coarser clasts interspersed. 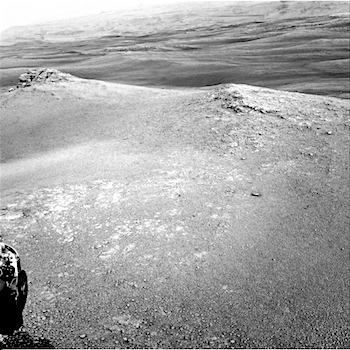 This entry was posted in Reports and tagged Aeolis Mons, CBU, clay-bearing unit, Curiosity, Gale Crater, Greenheugh, Mars Science Laboratory, Mount Sharp, MSL, Murray Formation, NASA, St Cyrus, St Fergus, Vera Rubin Ridge. Bookmark the permalink.